The abradant supplied with the Taber® Linear Abraser and Reciprocating Abraser is referred to as a Wearaser®. Comprised of silicon carbide or aluminum oxide abrasive particles embedded in a resilient or vitrified (clay) binder, the Wearasers are designed so the binder material breaks down during use - thus exposing and creating a new abrading surface. Utilizing a proprietary formulation developed by Taber Industries, two general types of Wearasers are offered - Calibrase® (resilient identified by "CS" reference) and Calibrade® (non-resilient identified by "H" reference). With standardized grades to meet varying requirements of abrasive action, many different types of material surfaces may be evaluated. The quality and uniformity of the Wearasers is maintained by continuous inspection sampling and tightly controlled manufacturing processes. The standard Wearaser has a diameter of 1/4" and is the size and shape of a pencil eraser. This is secured in place with the Wearaser collet with approximately 0.100" exposed for testing. Two other abradant configurations are also offered. The Jumbo Wearaser has a 1/2" diameter (requires the Jumbo Wearaser collet assembly) and the Weardisc™ is a 3/4" diameter by 3/16" thick (requires the Universal Attachment). Due to the larger contact area, both the use of the Jumbo Wearaser and Weardisc should be limited to flat specimens or samples that have little to no change in its shape / contour. 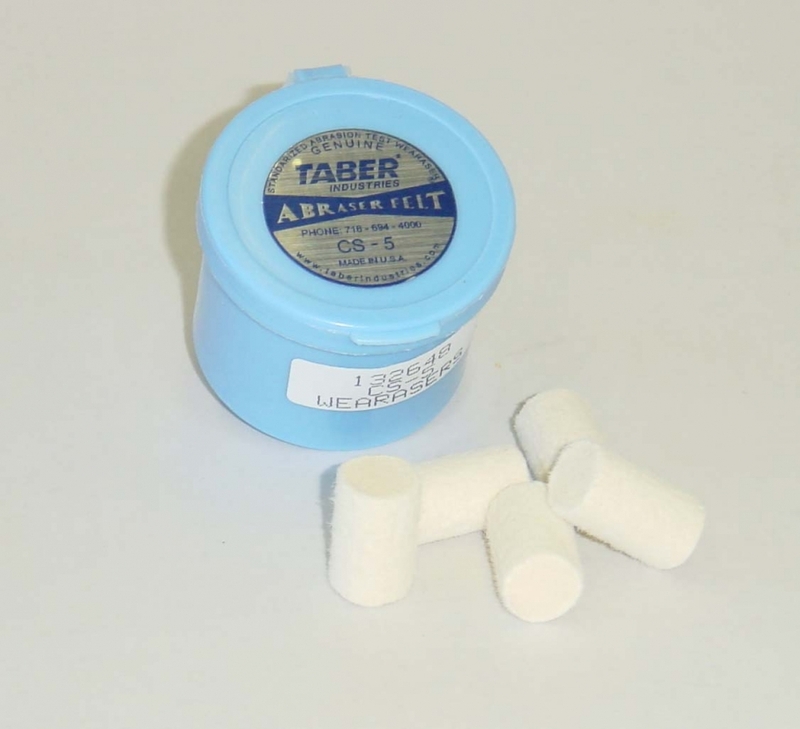 Taber recommends applying the Weardisc to the Universal Attachment with pressure sensitive adhesive. How long the abradant will last is dependent on the load, surface texture and frictional characteristics of the material being tested and frequency of refacing. CS-8 Calibrase - Resilient Wearaser that produces extremely mild abrading action, designed to operate under light loads. CS-10F Calibrase - Resilient Wearaser that produces mild abrading action, designed to operate under light loads. CS-10 Calibrase - Resilient Wearaser that produces mild - medium abrading action. CS-17 Calibrase - Resilient Wearaser that produces medium-coarse abrasive action. CS-19 Calibrase - Resilient Wearaser that produces coarse abrasive action. Prior to testing, Calibrase Wearasers should always be refaced with the S-14 Refacing Strips to ensure the surface is refreshed. Depending on the material being evaluated, the Wearaser surface may change (i.e. become clogged) due to the transfer of material from the test specimen to the abradant. Should this occur, the Wearaser should be refaced periodically during testing. WARNING: Because of possible deterioration, Calibrase Wearasers should NOT be used after the expiration date printed on the container. H-10 Calibrade - A non-resilient, vitrified Wearaser that provides medium abrasive action. H-18 Calibrade - A non-resilient, vitrified Wearaser that provides a medium - coarse abrasive action. H-22 Calibrade - A non-resilient, vitrified Wearaser produces a coarse abrasion. H-38 Calibrade - A non-resilient, vitrified abrading wheel that provides a mild abrasion. Comprised of very fine abrasive particles, similar to a polishing stone. 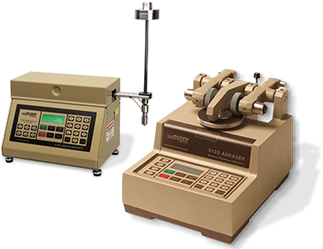 Prior to testing, Calibrade Wearasers should be refaced with the Diamond Coating applied to the Wearaser Depth Gage / Sharpener. To prevent sharp edges, utilize this tool to chamfer the edge of the Wearaser. NOTE: Calibrade Wearasers do not have an expiration period. CS-2 Calibrase - Resilient Wearaser that has no abrasive material. CS-5 Calibrase - Resilient Wearaser that is comprised of densely compacted felt. May be used for dry or wet rub tests. Only available as 1/2" Jumbo. CS-7 Calibrase - Similar to CS-5 but slightly harder for increased abrasion. Only available as 1/2" Jumbo. H1 Felt - Resilient Wearaser that is comprised of densely compacted felt according to DIN 61200. Only available as 1/4" diameter. 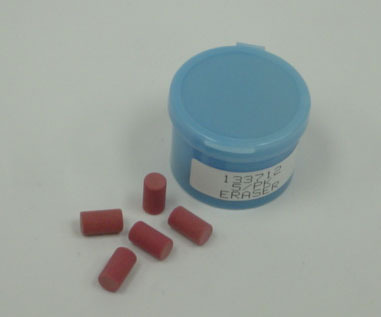 Eraser - According to MIL 12397. Resilient Wearaser that produces very mild abrading action, designed to operate under light loads. Standardized textiles are commonly employed to conduct rubbing / abrasion tests. Perhaps the most popular is the standard Crocking Cloth which was originally used to determine the color fastness of textiles to dry/wet rubbing. This square cloth is typically wrapped around a 16mm diameter "finger" and held in place with a wire spring clip. Testing consists of rubbing it back and forth over the specimen surface. Other textile abradants include crocking felt, #10 cotton duck, 14 oz. blue cotton denim, and a variety of other materials. Taber's Crockmeter Kit or Crock Block Finger are recommended when utilizing textile abradants with the Reciprocating or Linear Abraser. Steel wool is comprised of very fine, flexible steel filaments that are randomly assembled in a small pad. Available in different grades, the finer grades of steel wool (such as 0, 00, 000 or 0000) are regularly used to conduct abrasion testing by companies interested in evaluating their product's resistance to marring and abrasion. 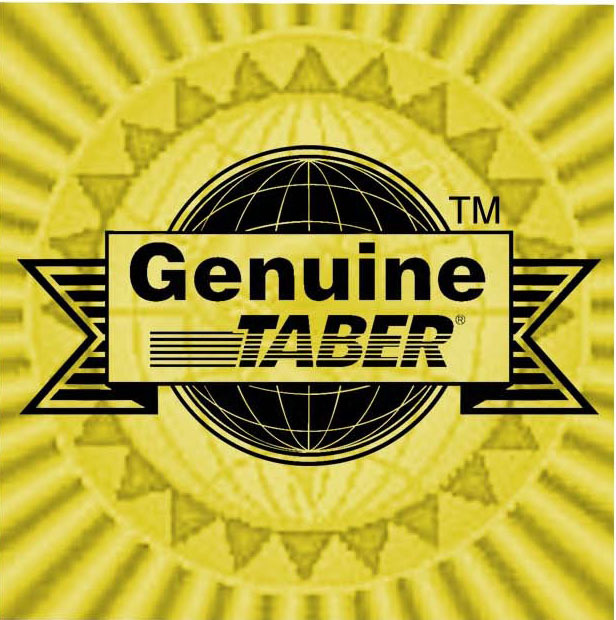 Taber's 10mm or 20mm Square Finger Attachment incorporates a compressible neoprene rubber pad to help secure the steel wool in place during testing. Another option is the Steel Wool Holder in which a gently rolled section of steel wool is inserted into the opening until approximately 1 cm is exposed. Similar to steel wool, a nylon scouring pad (e.g. 3M's Scotchbrite®) can also be used to generate surface damage. Manufactured from flexible, non-woven fibers this product has been utilized to produce micro-scratching or marring. Scotchbrite pads are available in different grades of abrasiveness, and the recommended attachment is Taber's Abrasive Pad Kit. IMPORTANT: It should be noted that steel wool and scouring pads inherently have variation and were not intended to be a tightly controlled abrasive product. Sandpaper and other coated abrasives are also used for conducting abrasion tests. The selection of which grade of sandpaper to use depends on the material. A fine sandpaper typically will create very light scratches on the specimen surface whereas a coarse sandpaper may result in heavier gouges and increased material removal. NOTE: Abrasion tests are all subject to variation due to changes in the abradant during the test. As a result, the abradant should be monitored and / or changed at frequent intervals. With disposable abradants such as those mentioned above, the abradant is used only once or changed after limited use.